I live in Sicily and am planning to build a TBH. I would greatly appreciate any thoughts or suggestions from anyone who has experience in using TBH's in similar temperature zones 25's-30's. It rarely (once every 20 years or so) gets below freezing. I am thinking of using either a mesh or Eco floor, a raised roof to allow for tool storage above the TB's and to allow for addition ventilation (if needed) in the summer. I could also install a temperature probe into this area (where it would not affect the bees) but would allow me to monitor the above bar hive temperature and indicate if I need to open roof vents. Am I over thinking it? The plans I will be using are from The Barefoot Beekeeper. Any thoughts and suggestions greatly relieved. I'd consider insulation above the top-bars, under the roof. Insulation keeps heat out as well as in! Also try and site the hive so it is in at least partial shade at the hottest part of the day. no experience in that heat myself. Although Phil's plans are excellent it my observation (and observation only) that those in hotter regions seem to favour TBHs with wider top bars and shallow hives than the dimensions laid out by Phil. This may be to allow greater comb attachment to reduce the chances of collapse. Although I agree with you on the wider shallower comb I think most other places in the world use langstroths & have TBH bar widths that tally with that, as I'm sure if you ask Phil his reasons for 17" bars was to tally with British National sizes & nothing to do with our wetter colder climate. Yettiman having additional ventilation is unnecessary IMHO. The bees are adapted to maintain their environment & temperature at the optimum. As has been said a wider shallower bar allows more comb attachment for less weight & placing the hive so it's shaded at the hottest time of day also very good advice IMHO. But the basic design TBH was originally developed for hotter climes than Sicilly so I wouldn't change too much. In that case, I will modify the dimension to suit the local Dadant hive frame widths, and reduce the height of the hive accordingly. I will work out a dimension to give the bees the same surface area per frame / bar (not sure what a Drawn out bar is called if it has no frame, a comb? I will keep the roof to a simple pitch (with insulation) and rely on the bees (they will be locally sourced after all) to handle the temperature. I know enough not to site the hive, in direct sunlight, drafts or wind channels, but still with good clear access to a flight path. I have picked out a spot between two massive Prickly pears and near the Almond orchid. Again HUGE thanks, for such informative replies. Keeping heat in excess of brood temperature (35C) out of the hive is important to avoid comb collapse, as well as to avoid giving the bees too much work to do keeping it cool. Reflective roof, insulation above the bars and a decent thickness of timber all help, as does providing some shade from the afternoon sun. 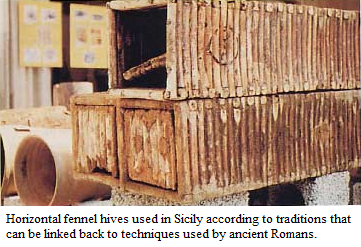 The traditional Sicilian hive is a long, square-section clay pipe, which I should imagine does a good job of keeping the inside reasonably cool. Someone sent me a link to a video about them ages ago, but I can't find it. If someone else can, perhaps you could post a link? I am afraid there are a few more dimensions than just langstroth and national top bar length. If these are anything like the ancient Egyptian pipes ( which had a circular cross section ) they were often embedded into walls, either purpose built or simply walls of existing houses. Either that, or they were piled on top of each other, effectively in a wall made out of hives, with the outermost hives left empty. These empty hives were in effect the double glazing, providing the insulation. According to Eva Crane, these were used right across the Mediterranean until quite recently. I don't think clay on its own is a particularly good insulator. - fennel stalk hives ! Posted: Tue Feb 17, 2015 6:09 pm Post subject: A nice post - a Fennel stalk hive. The three Aparies I have seen are all Dadants. Pity, I like the historic look of the Fennel.